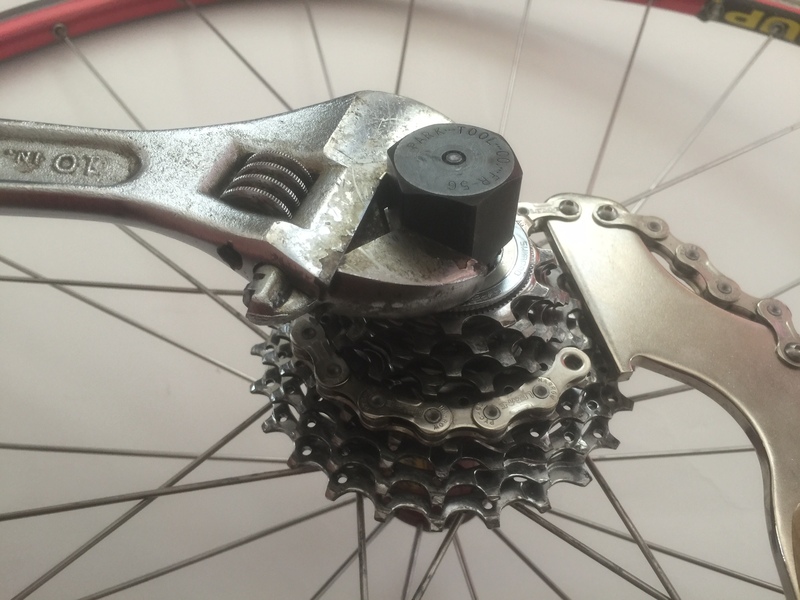 How to take off your cassette and give a good clean . . . the proper way. Last week, I talked about being lazy. Because there’s nothing quite like getting your bike kinda clean by taking the easy way out–works for me. 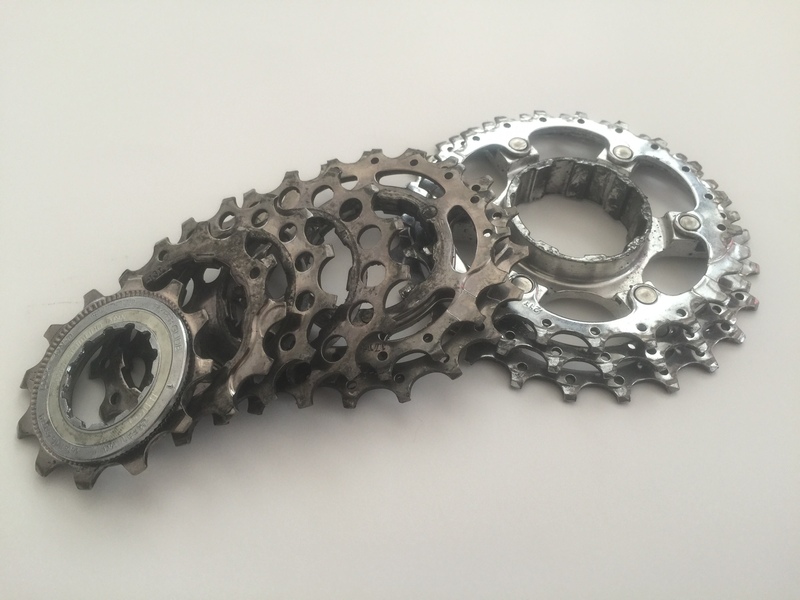 But in response to popular request, I’m adding another article detailing the “proper” way to clean your drivetrain: removing your cassette to getting it seriously de-grimed. For this method, you will need a few tools to make life easier on you as well as a good degreaser. If you’re interested in building a budget bike toolkit, check out our past article that details the essential tools you’ll need to complete most repairs on your bike–including cassette and chain maintenance. 1. 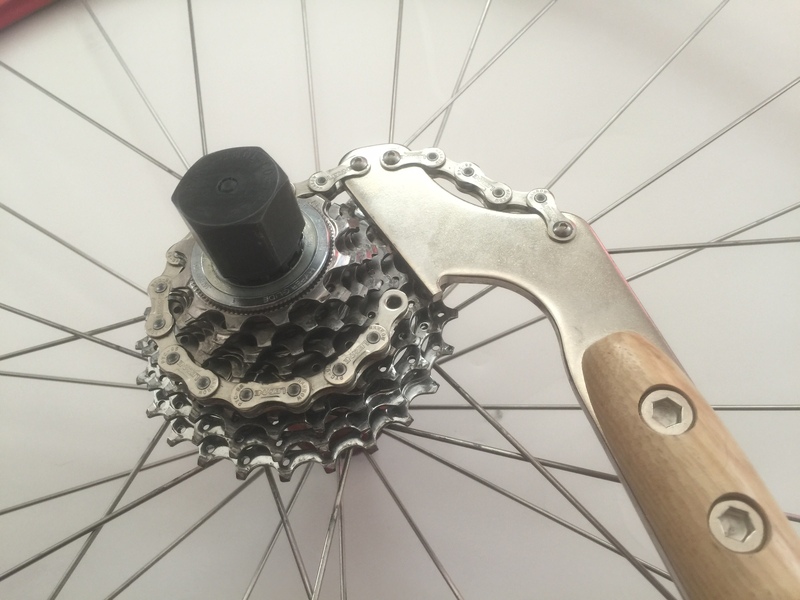 Chain whip: To remove your cassette easily, you’ll want a chain whip. You can buy a relatively inexpensive tool, which should work just fine. But I personally own and like the one to the left (Lezyne’s CNC Chain Rod) because it’s made with some serious quality. But you can also check out this video to make your own chain whip with old parts that you probably have laying around in your garage. 2. Lockring removal tool: Dependent on your type of cassette, you’ll need a specific locking removal tool to get the cassette off. You can also use the shady methods found on the internet, but I haven’t really seen one that doesn’t trash the wheel or cassette in some way. 5. Degreaser: I’m not too particular about brands here. Most solid degreasers will do just fine. I use Simple Green because it’s cheap and comes in large quantities. If it’s concentrated, you’ll definitely want to mix it with water. 6. A bucket, or a sink you don’t care too much about. Don’t panic. This is quite easy as long as you have the proper tools. Remove the rear wheel and the skewer. Might not be an obvious thing. If you’re having trouble with this step, don’t feel bad. We’ve all gotten the rear derailleur in the way at some point. 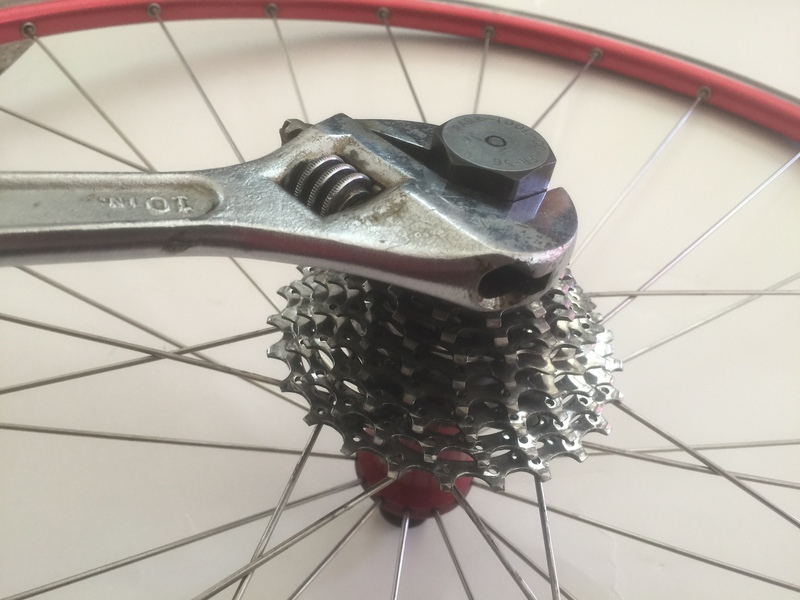 Make sure to shift your chain all the way to the smallest cog. Open and loosen the skewer. Then, carefully grasp the body of the derailleur and push it open. The wheel will pretty much just fall right out. With the wheel cassette up on a table or your lap, wrap the chain whip around a cog somewhere in the middle of the block. You’ll be holding this to basically keep the free hub from spinning. Insert the locking removal tool into the top of the cassette. Make certain it’s seated all the way, and the splines are fully fitted within the cassette. You’ll use your adjustable wrench on the end of the lock ring tool to turn it to the left. Basically, you’re turning the chain whip and the wrench in opposite directions of each other–the chain whip going right, and the wrench going left. Now that the lockring is removed, just pull the cassette off of the hub. When you do this, be careful not to let any loose spacers fall out of order. While it’s not always the case, some cassettes have differently-sized and specifically placed spacers between the cogs. If that’s so with your bike, you’ll want to make sure everything gets put back on in the same order that it came off. Generally, I like to grab some twine or an old shoelace (for some reason, I always have string around) and tie it loosely through the hole in the cassette. This lets me clean everything while still keeping it all in order–and so I don’t have to think about it when I put it all back. Whatever you do, don’t ever let anyone tell you you don’t have options. There’s really no best way of cleaning your cassette once it’s off–all the methods work just fine (OK, maybe some internet methods are lame). Here are a couple of my go-to’s. Dump it in a bucket: If you’ve got concentrated Simple Green, dilute it at about a 1:1 ratio with water in a bucket or tub of some sort. Let your cassette soak: Usually about 15 minutes or so should get everything broken up really well–especially if you have a cluster of cogs that don’t separate. Take a toothbrush, rag, or floss to the parts that haven’t quite come clean. If need be, wet any of them down with a little more degreaser and wipe away the gunk. For serious crannies, consider wasting a great deal of time using a q-tip on the trapped grime. Wipe it all down with a clean cloth. Boom! Done. Lay a rag down on a flat surface, and spread out the cogs and spacers along it. Spray each side of each cog with degreaser and wipe them with the rag (or another cloth to make things easier). Floss between any cluster of cogs by soaking a rag or gear floss with degreaser and working it between the gears. I actually have tied a piece of gear floss to my work stand and held it taught with one hand while I run the cluster along it with the other hand. Works. Wipe it all down again with a dry rag, and you’re good. If you kept everything in order, replacing the cassette is a simple matter of putting it all back on. In fact, it should just slide back onto the hub as long as you’ve lined up the proper grooves and tabs. Put a dab of grease on the lockring (that’s the topmost, threaded piece), and hand tighten it back in to make sure you haven’t cross-threaded anything. Once it’s seated properly, drop in the lockring tool, and tighten it back up. You’ll just need a wrench for this part. If you have a torque wrench, which is handy but expensive, set this to 40nm. Oh hey, you’re done! Just put the wheel back in with the chain at the smallest cog, and brag about how clean your bike is now. Seriously, call someone if no one is around. Thanks for a great article so clearly written. I have a cruiser with a freewheel, and I’ve had that apart, I mean, right down to taking the ball bearings out. I just bought another bike with a cassette and I’ve already ordered the tools to remove it for when the time comes to clean it.